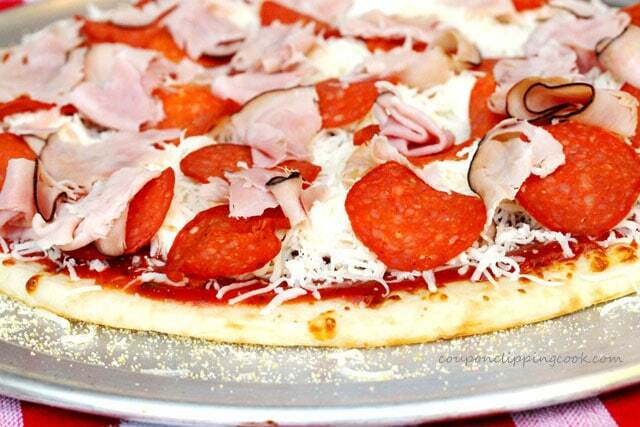 Here’s an easy way to make scrumptious pizza that’s semi-homemade with premade crust and a quick homemade pizza sauce. 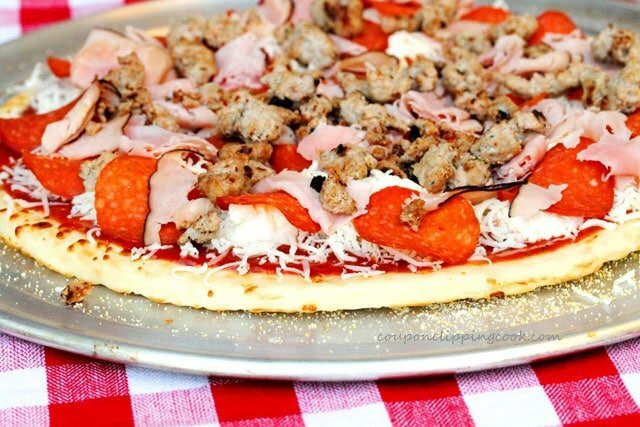 This recipe includes some traditional toppings; turkey pepperoni (which is actually 70% less fat than regular pepperoni), cooked Italian sausage and pieces of sliced deli ham. 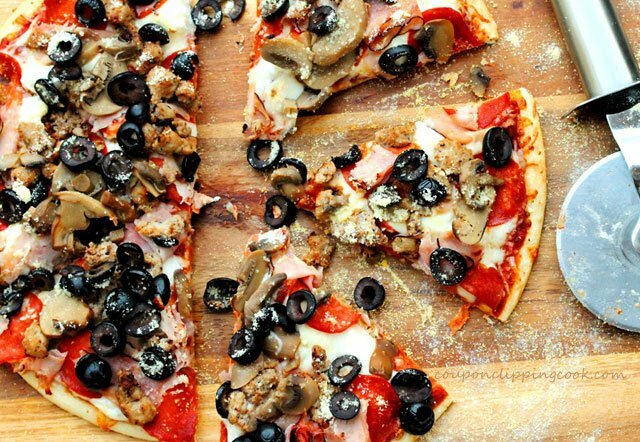 Sliced mushrooms and black olives are added for good measure. 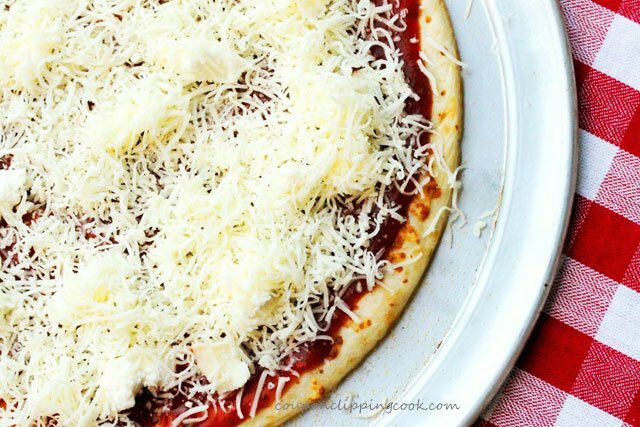 There are also 3 types of cheese on this pizza, shredded mozzarella, dollops of ricotta cheese and grated Parmesan cheese. 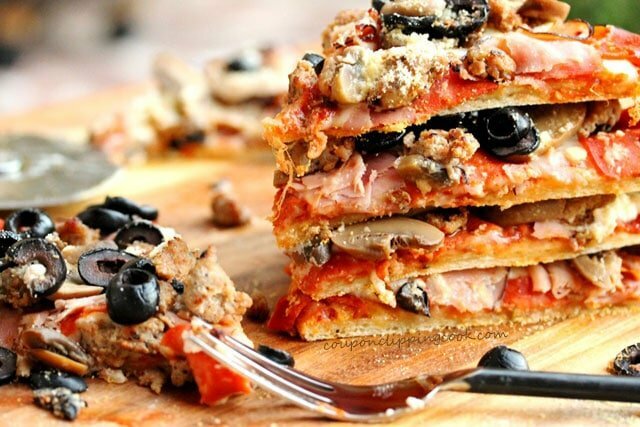 The best part is that the toppings on this pizza are highly customizable so feel free to substitute the toppings with your favorite ingredients. 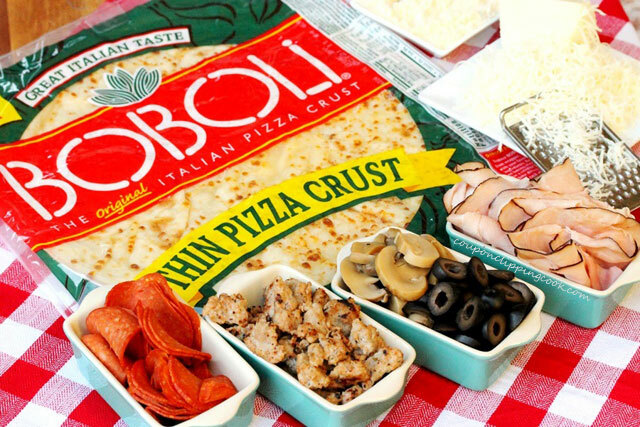 I like to use Boboli thin pizza crust. 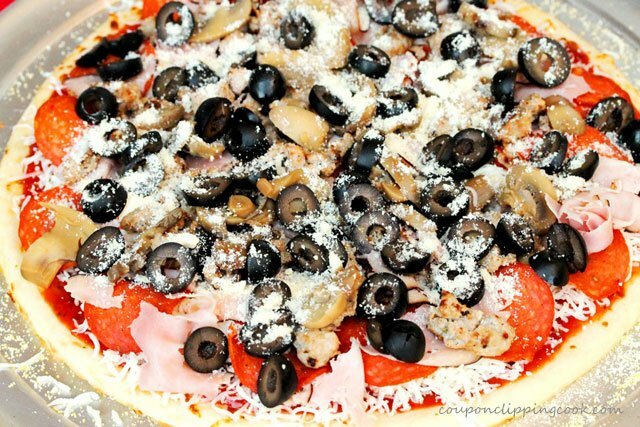 There’s also a whole wheat version of Boboli crust that tastes wonderful as a pizza crust. 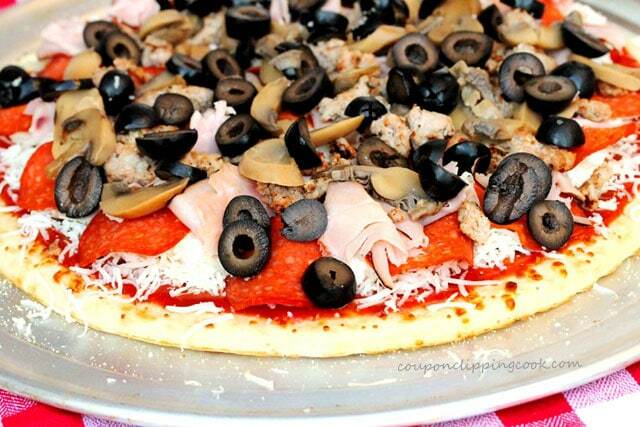 Feel free to change up the crust to another type of premade crust if preferred. 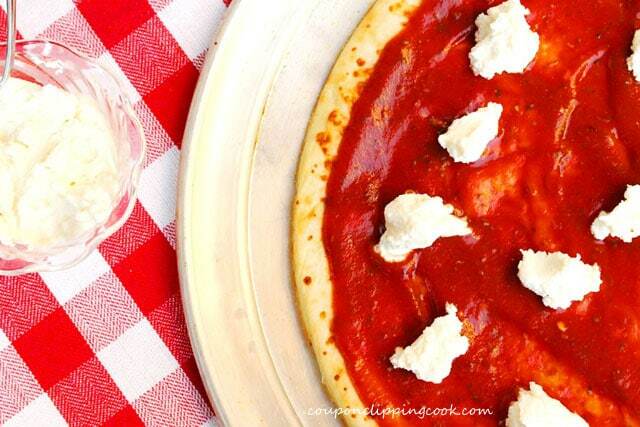 Here’s a recipe a naan bread crust that tastes really good too “Tomato, Basil and Ricotta Naan Pizza“; and a recipe with homemade dough that tastes divine “Heart-Shaped Pizza; 3 Varieties“. 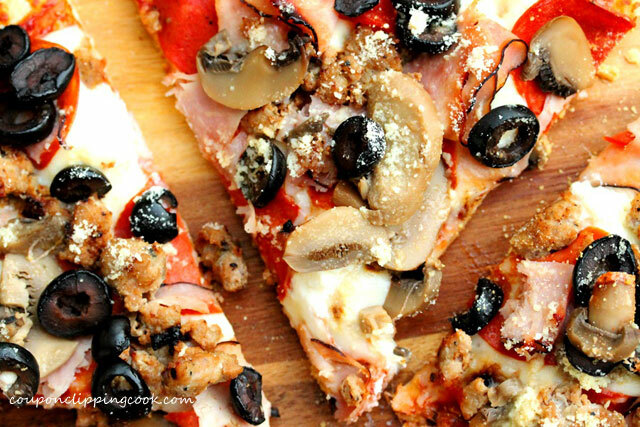 This pizza makes a delicious dinner or appetizer. 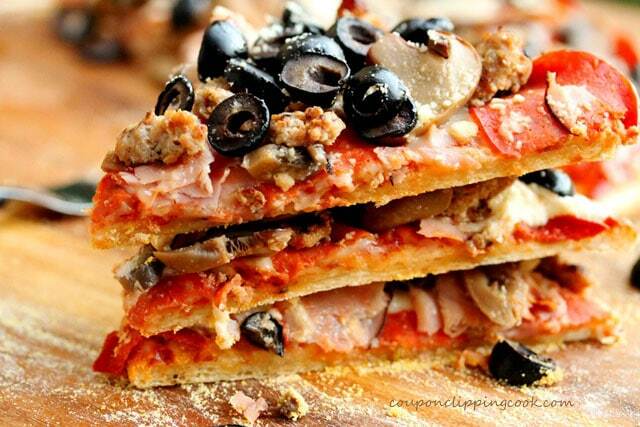 To serve as an appetizer, just cut the pizza into small pieces for a quick and easy finger food. 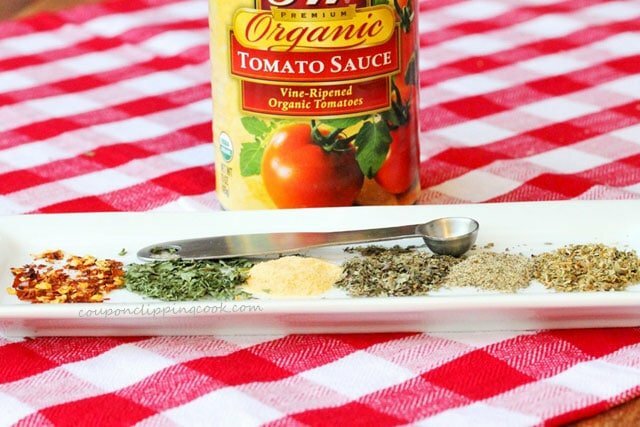 In a medium size bowl, add tomato sauce, oregano, basil, granulated garlic, parsley, and red pepper flakes. Sprinkle the cornmeal on a large baking sheet or pizza pie pan. Cornmeal is used so that the crust doesn’t stick to the pan. Lay the premade pizza crust on top of the corn meal. 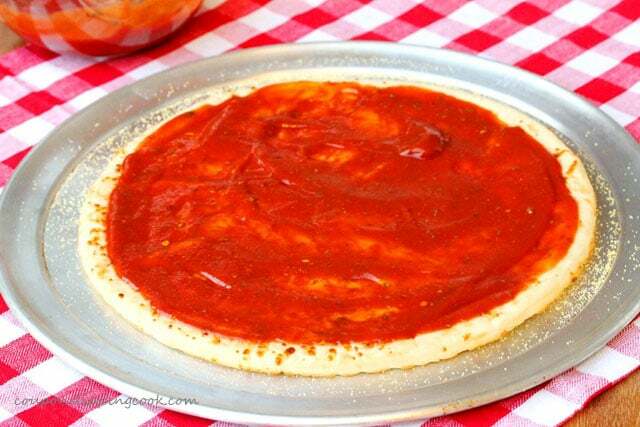 With a medium to large size spoon, add about half of the pizza sauce over the top of the crust (add more if you like a lot of sauce). 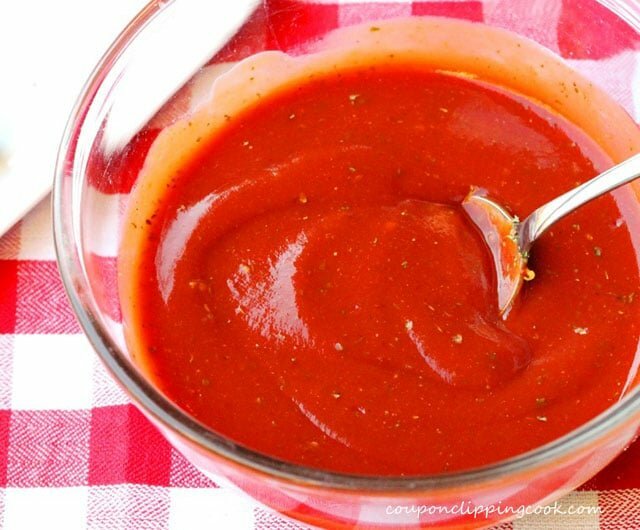 Using the back of the spoon, spread the sauce over the crust (leave about 1 inch of empty space around the edges). 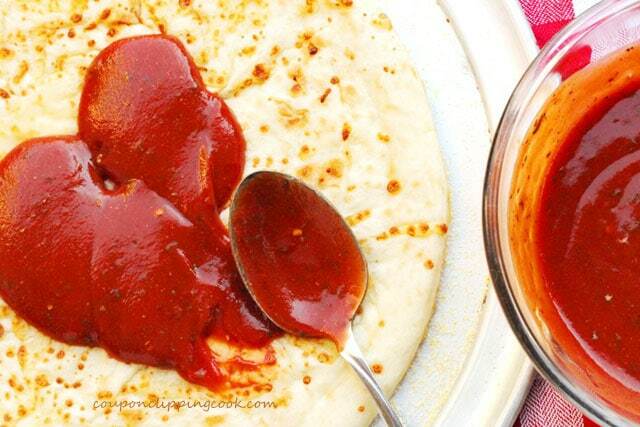 The remaining sauce can be used for making small size pizzas on English muffins or slices of French bread. Or it can be frozen for future use. 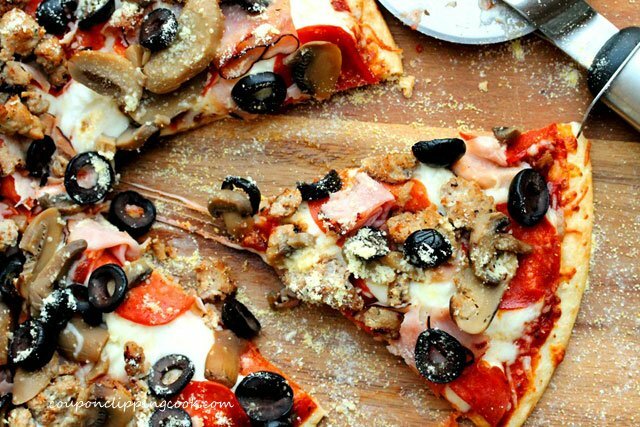 …add the ricotta cheese in small pieces around the entire pizza. Then add the mozzarella cheese evenly over the top of the pizza. 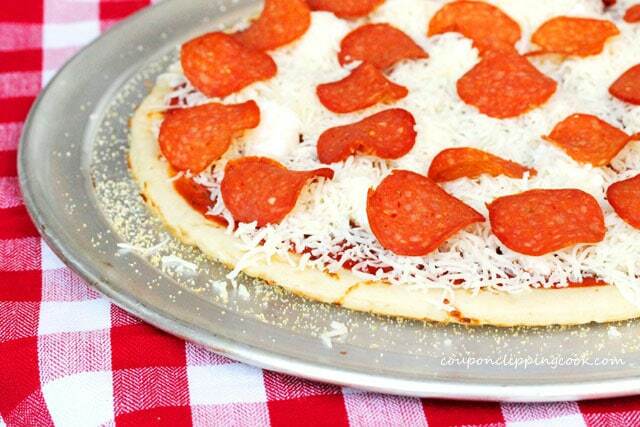 Top the cheese with sliced pepperoni. Then tear the ham into medium to large size pieces and spread it around the entire pizza. I like to use black forest ham which has the pretty dark edges around it (tastes so good too). Then add the cooked sausage. 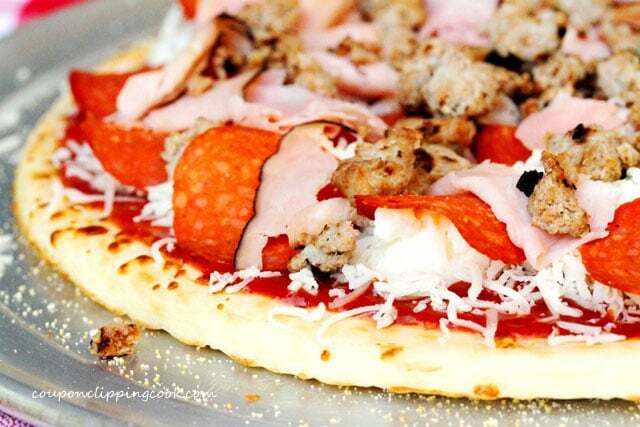 Sprinkle grated Parmesan cheese on top of the entire pizza. 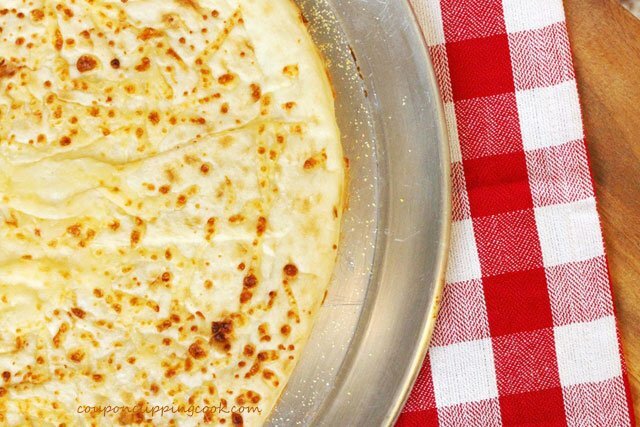 Bake in a preheated oven until the cheese melts and the edges of the crust are slightly golden (about 15 minutes). 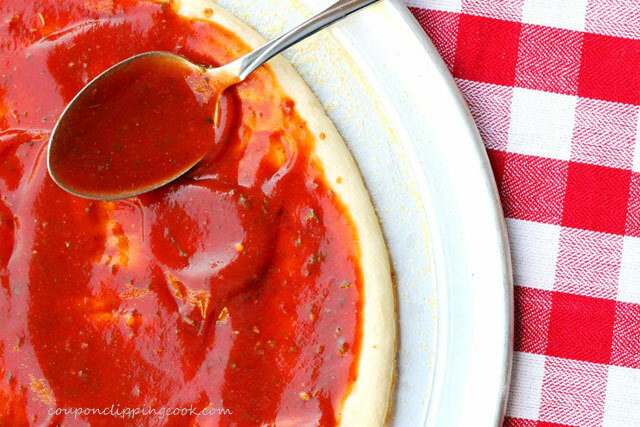 A quick and easy pizza with homemade sauce. 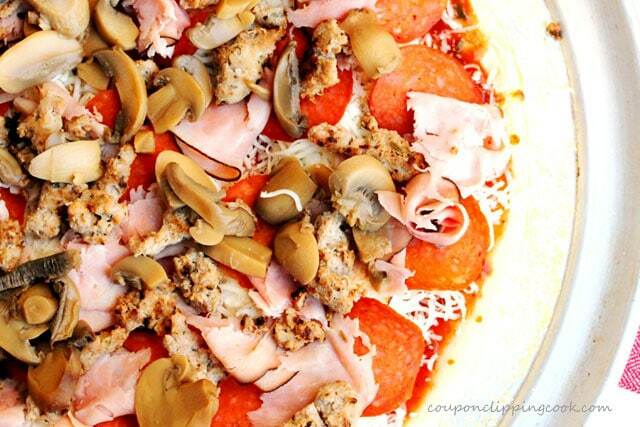 The toppings can be customized to your favorite ingredients. 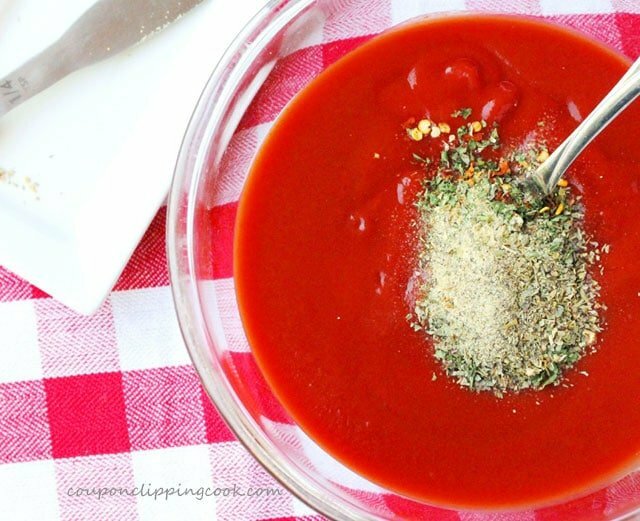 To a medium size bowl, add tomato sauce, granulated garlic, dried oregano, dried parsley, dried basil, dried red pepper flakes and pepper. Stir together. Set aside. 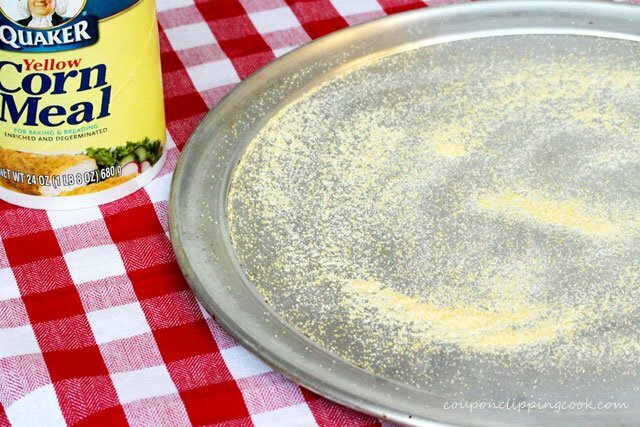 Sprinkle the cornmeal on a large baking sheet or pizza pie pan. 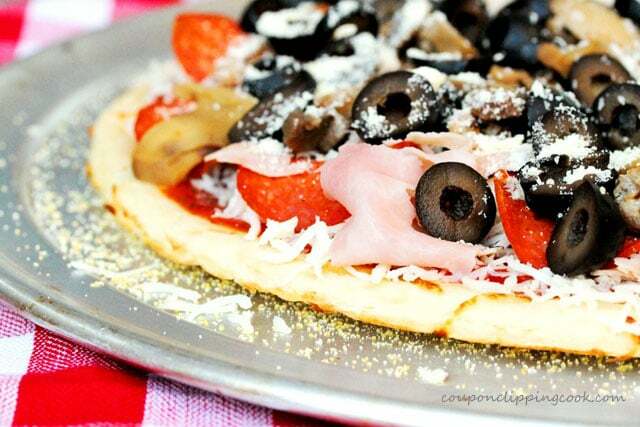 Lay the prepared pizza crust on top of the corn meal. Evenly spread the sauce over the crust with the back of the spoon (leave about 1 inch of empty space around the edges). 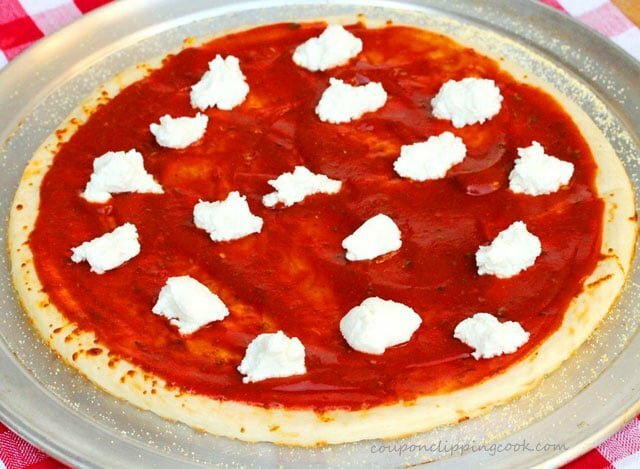 On top of the sauce, add small pieces of ricotta cheese around the entire pizza. Then add the mozzarella cheese evenly over the top of the pizza. Next, lay the slices of pepperoni around the entire pizza. 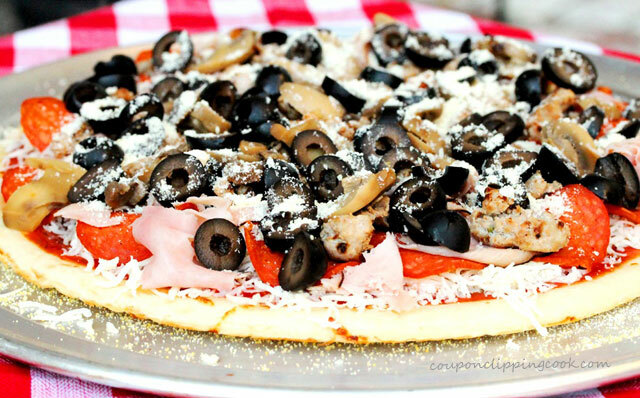 Top with pieces of ham, cooked sausage, sliced mushrooms, and black olives over the entire pizza. Bake the pizza in the middle of a preheated oven until the cheese melts and the edges of the crust are slightly golden (about 15 minutes). 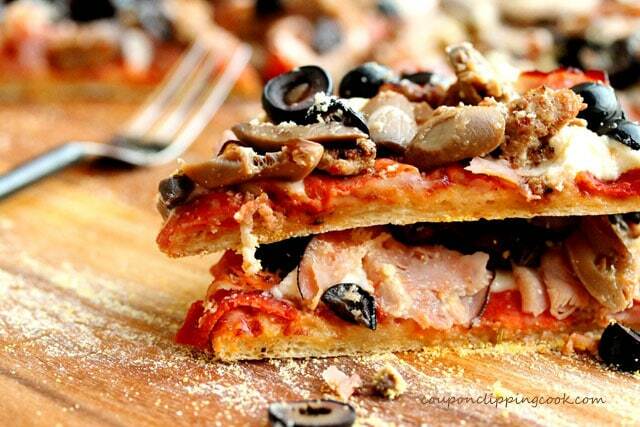 Cut the pizza with a pizza cutter and serve warm. Oh my gosh! 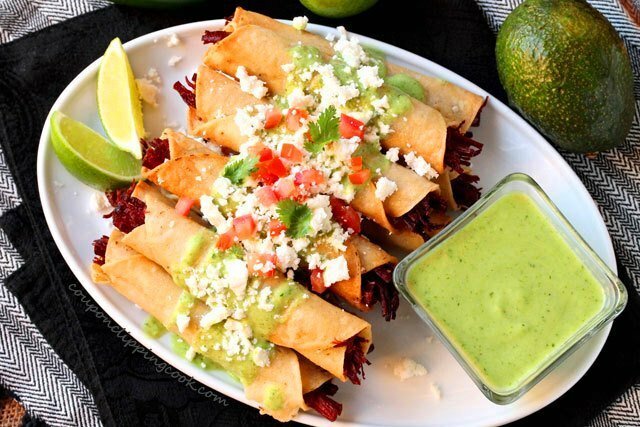 I was going to order some delivery pizza for my kids tonight so the hubby and I could go out for drinks, but this looks so good I’m thinking about heading straight out to the grocery store instead. Love the idea of putting ricotta on the pizza. Have never tried that. Thanks for the inspiration! Hi Christin, thank you for stopping by and I’m glad you liked this recipe. Have a fun time tonight and a great weekend. 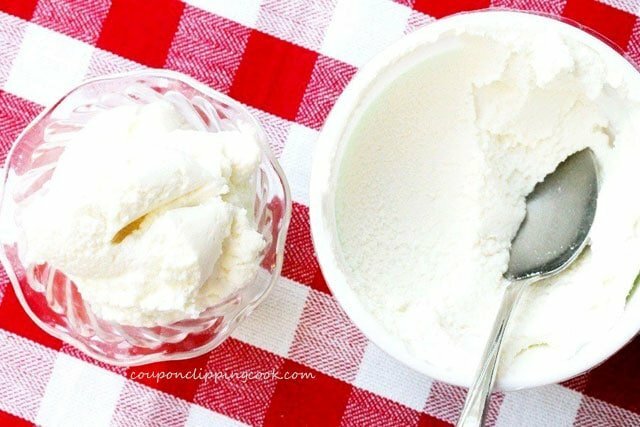 I love the addition of ricotta. That does look pretty simple!